Located at East Milton Square, Abby Park specializes in Modern American cuisine. The menu features the best in local, natural and organic products - Pat Woodbury clams from Wellfleet, tomatoes from City Growers in Dorchester and dairy from Thatcher Farm in Milton. 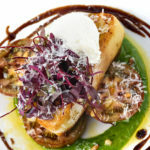 Mediterranean and European influences infuse chef Tony DeRienzo’s classic comfort fare with a bit of worldliness, making his dishes fun yet familiar. The first restaurant in Milton with a full bar since the 1800's, Abby Park is the perfect location for special events or spontaneous gatherings. The lively bar features daily specials and specialty cocktails; the stylish dining room is ideal for date night or family dinner; and the Adams Room can comfortably accommodate private functions for up to thirty-five. Chef Tony DeRienzo’s passion for cooking was ignited at a young age, thanks in large part to his Neapolitan mother, Raffaela. Growing up in Brockton, he often helped her prepare Italian feasts from scratch, including curing prosciutto in oak barrels, using a manual meat grinder to create homemade sausage, and making Italian gravy from the homegrown vegetables in her garden. At Johnson & Wales, DeRienzo refined his talents and bolstered his knowledge base, and, upon graduating in 1994, he joined the culinary staff of Ambrosia. Under the leadership of Chef and Owner Tony Ambrose, DeRienzo learned about the Back Bay restaurant’s French-Asian fusion cuisine and its many unique flavor profiles. He then went on to cook alongside the renowned Chef Lydia Shire at her critically-acclaimed BIBA, whose bold menu transformed the Boston dining scene and garnered her recognition as America’s Best Chef, Northeast from the James Beard Foundation. With stints under two of Boston’s leading chefs, DeRienzo’s impressive background and skill set landed him the role of Executive Chef at the Stoneforge Restaurant & Publick House in Raynham in 1998. He was quickly promoted, and, after just six weeks, found himself managing a 30-person staff. Over the next seven years, DeRienzo led the openings of four more restaurants for the group. He also oversaw a 180-seat function facility and developed an entire commissary that housed and provided all components for the restaurant group’s properties. Recognizing a talent in himself for successful restaurant openings, DeRienzo launched his own consulting company called Venture Restaurants in 2007. He opened The Waterfront Grille, the first restaurant in New Bedford Harbor, which garnered rave reviews and acclaim. In 2009, he consulted on the menu development and kitchen design for Milton’s Abby Park, and, in 2010, its sister restaurant in Plymouth, Alden Park, followed by Novara in 2016. As Executive Chef for the group, DeRienzo brings with him a unique perspective. Constantly experimenting with different ingredients and flavors, his food is modern American comfort with infusions of Mediterranean and Asian cuisine. Beyond his passion for food and cooking, DeRienzo practices mixed martial arts (MMA). DeRienzo discovered MMA four years ago when his young son started training. Recognizing the sport’s pure athleticism, DeRienzo, who has always made health and fitness a priority, immediately became involved himself. Today, he is a member of Lauzon MMA’s Team Aggression and competes throughout the Greater Boston area. Joe Lauzon, owner of Lauzon MMA and a well-respected UFC fighter, regularly utilizes DeRienzo’s talents in the kitchen and on the mat to prepare for his fights. The two train together and DeRienzo creates high-protein meal plans that Lauzon follows strictly for four weeks before each fight. DeRienzo currently resides in Raynham with his family.